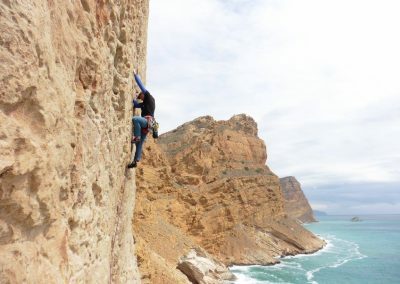 Climbing in Spain – The Sea cliff climbing course. With an aqua marine blue sea below gently lapping onto the shore; a Mediterranean blue sky above with just the right amount of white puffy clouds. The rocks of the most solid sandstone souring up above you. With the most experienced guide and instructor beside you to instruct and show you the way, this is just what you came for!  Yes this is the Compass West sea cliff climbing course. 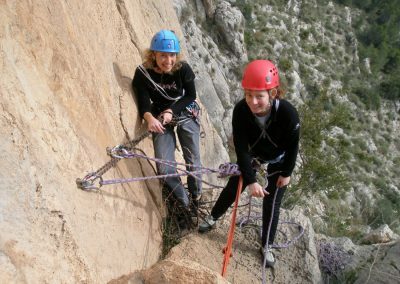 A five day course to visit and climb on the sea cliffs of the Costa Blanca. 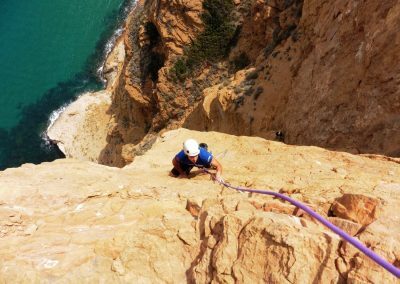 With more or less a guaranteed five days of sun on the most immaculate rock, this could just be the perfect holiday course you have hoped for. 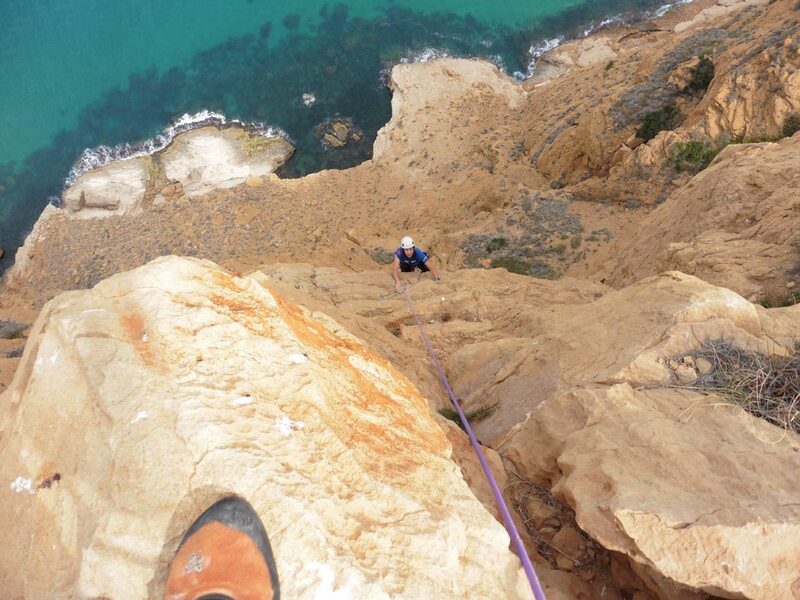 We, Rowland and Mark, are two of the leading explorers of sea cliff climbing on the Costa Blanca. 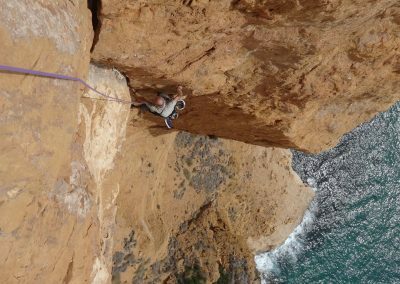 The Classic route ‘Rowland’s Magical Mystery Tour’ on the Toix sea cliffs has become a ‘must do’ for those who want to do adventure climbing. Their recent discovery of the sea cliffs of Sierra Helada (Gelada) has greatly increased the amount of adventure routes for this area. 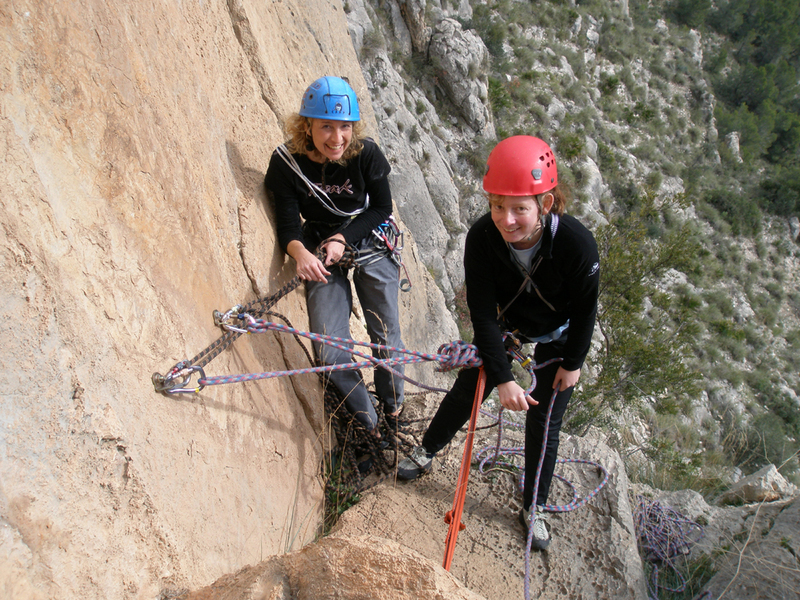 This course is suitable for those with some experience of climbing up to a standard of grade UK grade 4a- or French grade 1V-. Either on natural rock or indoor climbing walls. Day one. The course starts with our usual one day’s intro session, learning rope and belay techniques etc in the morning. In the afternoon we visit our local crag to put into practice some of the morning session and to experience some rock climbing so we can learn something of you and you of us. Day two. A full day a local a sea cliff or sport crag depending on the abilities of the group. We can use this day to get you up to speed for the coming sea cliffs. Day three. Basic rescue practice and a visit to one of our local sea cliffs..
Day four and five. All full days. 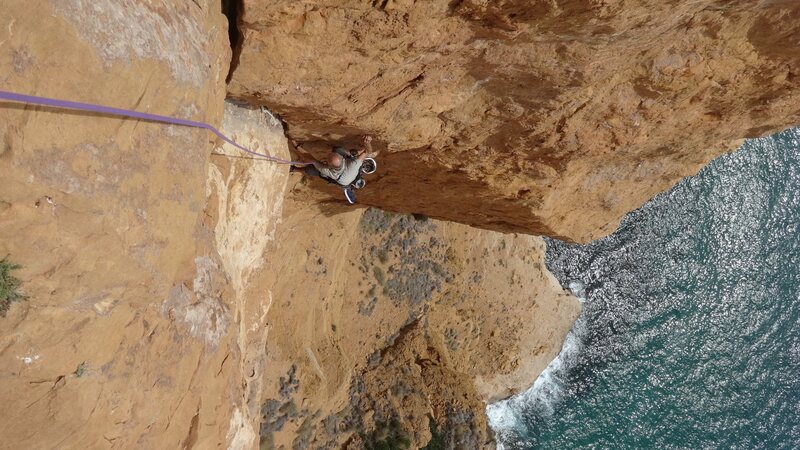 Full advantage will be taken of the groups capabilities to visit some of the more adventurous sea cliffs. Students who wish to continue to climb on the spare day (day six) can arrange an extra day which will be at an extra charge. 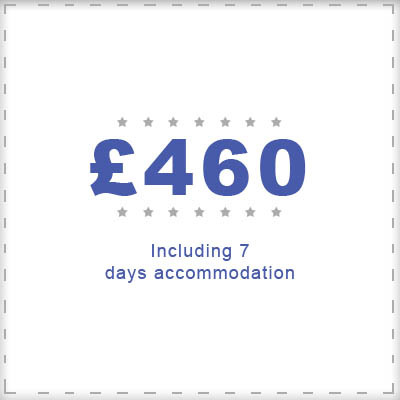 Most seem to want to use this as a rest day to visit local attractions or even to do a bit of mountain walking. The week is very active and by day five most students are very satisfied with their weeks climbing.